Recently I’ve been looking into the potential that Windows Server Core holds for our environment. Like most eager new Core users, I imagine, I jumped in with grand visions of spinning up a VM quickly and being off to the races administering it from my desktop. The reality wasn’t quite the same, as I ran into a chicken and egg situation wondering how I could set up the machine when I could not yet connect to it. To complicate the issue, I couldn’t find a concise list of information on exactly what is needed to simply make the machine available so that I could begin to work with it. With that in mind, I’ve compiled the following information in hopes of saving others the same headache. There’s nothing earth shattering here, but hopefully it will allow people to get started with Server Core quickly so that they can move on to more important things, like how the server will actually be used. Let me know if you have any questions or suggestions. Hope it’s a help to you. Ports to request from your firewall team. 445 (SMB) –This is up to you. I wanted to be able to move files to/from the server. Local firewall rules to allow remote administration. Enable-NetFirewallRule -DisplayGroup "Remote Service Management","Remote Event Log Management","File and Printer Sharing","Performance Logs and Alerts","Remote Volume Management","Windows Firewall Remote Management","Remote Desktop"
Add the remote computer to Server Manager (available on Windows desktop and server versions). Once added, you can easily launch Computer Management and PowerShell for that specific machine by right-clicking it. If remoting isn’t enabled on your local machine, enable it. 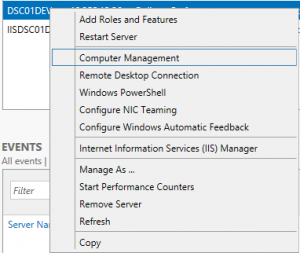 Connect from local IIS Manager for Remote Administration with the local administrator credentials of the remote machine. The utility “sconfig” can be used for most setup items. For a more speedy and scriptable setup, below are some common configurations via PowerShell. Set-TimeZone -Name "Eastern Standard Time"
One of the most profound turning points in my life was the moment that I gave myself the permission to lose. Please do not confuse this with apathy or a lack of ambition. It’s more of an upfront decision to roll with the punches, coupled with a focused vision on what is worth pursuing. Let me explain. By nature (or maybe nurture) I am a very task-oriented person. I’m also a bit of a perfectionist. I want to be the best in every area of my life be it work, ministry, family, or simply recreation. I can’t simply play a video game, I have to be able to play it on a competitive level. I can’t just work in my area of expertise, I feel the need to develop a comprehensive understanding of all technology. I also want to be able to play instruments, fluently speak other languages, read a long list of books, etc, etc, etc. Being task-oriented, I cannot start one of these and just let it go. I have to finish it or it weighs on my mind. I also cannot stop everything else in life for that one task, so I spin up tasks in multiple areas. All of this combined, over time, becomes a huge drain on my mental and physical energy. Not only that, I begin to feel like a failure in each of these areas when I fall short of expertise in all of them. At this point you’re probably feeling stressed just from reading this. Imagine waking up and feeling the burden to accomplish all these tasks while still feeling the sting of not accomplishing them the day before. Living that way just isn’t sustainable. Then one day I was praying during my devotional time and the thought occurred to me, what if I choose to lose? I’m not a quitter, so the idea of giving up on anything was repulsive. However, as I thought about it I began to realize that by pursuing this laundry list of interests I was already leading myself to failure in those things that matter most to me. Just as our parents always told us, “you can’t have your cake and eat it too”. We are all dealt a finite amount of time and energy. By choosing to involve myself in everything I’d taken away the option to truly invest myself in anything. It occurred to me that in order to win the right battles, sometimes you have to lose the wrong ones. From that point I began to ask myself what I was really after in life, and I started to set aside those things that didn’t contribute toward those goals. This has lead to a laser focus in my life that I did not have before. At work I focused on strengthening my skill in database technology. To do that I had to let myself lose in the areas of Linux, programming, web development, and others. I don’t need to be a leading expert in every technical field to do my job well and have a fulfilling career. I also decided to lay off on video games and learning the guitar so that I could focus on learning Spanish. Ministry to the Hispanic community is a driving passion in my life and it became clear to me that these other hobbies were eating up the time and mental energy that I needed to devote to Spanish and Bible study. I want to be careful not to portray the wrong idea. I’m all for challenging yourself in new areas and having diverse interests. It’s all too easy to get into a rut, which leads to other issues. There will be a day when I pick up the guitar again or study programming in C#, but today is not that day. If I master Spanish and therefore complete a critical piece of a primary goal, then I’ll move on to music. The point is to be aware of what you’re going after in life and to make sure you’re not sabotaging those goals by splitting yourself in too many directions at once. There is another facet of giving yourself permission to lose that has more to do with humility. Sometimes we become overly aggressive/competitive in our desire to be the best. Or, even worse, we don’t even jump in because we’re too afraid that we’ll do badly. Giving yourself permission to lose up front frees you to both enter the activity and enjoy honing your skill in it, regardless of what the people around you do. Decide up front that even if you look like an idiot you’re going to do it anyway. And once you move past there and begin to develop some skill (and you will), do it in humility. Make your goal to be the best you can, not better than others. And help develop others along the way, even if that means they become better than you. Get out there in life, stay focused on what is important, and enjoy giving it 100%. Set yourself up to win in what’s important by giving yourself permission to lose. This week a US judge asked Apple Inc. to help them unlock the iPhone that belonged to one of the San Bernardino shooters. The CEO of Apple, Tim Cook, has resisted this order citing risk to his customers and implications that extend past the case itself. Since then, notable people have stood up in defense of each side. On the one hand some say that not unlocking the phone is helping terrorists. The other side says that this sets a dangerous precedent, and that the FBI is just using one case to open the door for unlocking any device they want in the future. I don’t claim to be an expert on security, government, or terrorism. However, there are a few things I’d like ‘we the people’ to keep in mind as this discussion unfolds. The government does not have a good track record of using their abilities in a limited scope. Recall if you will the Patriot Act. Many people were okay with it initially because of its promise to aide in stopping the terrorist threat. However, years later we know that it’s been used to access innocent citizens’ information on disturbing levels and has been active past the time it was intended for. I want to hope that our government would not use device access methods maliciously, but I don’t think any of us are naïve enough to rule out the possibility. It’s unnecessary to force Apple’s hand. If any organization in the world should be able to crack an iPhone it’s the FBI. They have some of the best tech minds in the country, one of the most technically developed countries in the world, at their disposal. Aside from that, there are independent hackers available for hire. John McAfee , creator of McAfee antivirus, recently volunteered to do this for free. That would allow us to access the data without setting a legal precedent that allows the government to force companies into unlocking customers’ devices. We’re slipping into a dangerous mindset where anything is acceptable if there is a remote possibility of catching terrorists. Not that we shouldn’t be vigilant about tracking terrorists and securing the country, but at what point are we doing ourselves more harm than good? If we continue down the trail of sacrificing liberty for security then we’ve already accomplished the terrorists’ goals for them. They will have defeated the American spirit and caused us to relinquish ourselves to servitude. Not servitude to an oppressive regime they placed on us, but one we created ourselves, driven by our fear of them. Also, on a more conspiratorial note, we can’t assume that ill-intentioned individuals or organizations wouldn’t use that fear as a carrot to drive us farther and farther down a path that releases liberty and gives them power. The use of terrorism seems increasingly like the wars of George Orwell’s ‘1984’. Is it Eurasia or Eastasia that we’re fighting now? I can never keep track. In summary, there will be innumerable situations through the years where the question of security vs liberty will be raised. Don’t be quick to assume that everything marketed as anti-terrorism is pro-American, and when in doubt err on the side of liberty. When looking at which tech toys to use it’s easy to differentiate by the upfront cost. An iPad, for example, can be twice the price of some of its competitors. This can certainly be prohibitive, no matter the quality of the device. I very much enjoy my Macbook Pro, but I would not be using one if work had not provided it for me. For many people it’s just not feasible to pay such a large cash amount upfront, and understandably so. But is the monetary cost of the device itself the only consideration? Maybe we should be asking how or why other companies offer theirs for less. For the purpose of this article I’m going to pick on Google simply because they are the largest company utilizing a competing model. They are certainly not the only ones but have arguably been the most successful at it. The model I’m speaking of is that of advertising. Every time you go to their website Google displays tiny advertisements that other companies have paid large amounts of money to have placed there. But we all know that the most effective advertising is targeted advertising, getting exactly the right ad to exactly the right person. This is where the rest of Google’s services come in. By providing a litany of well-built, completely free services Google invites thousands of users to connect to their systems. While doing this, they gain mountains of data about you, your interests, your social circle, and their interests. This allows them to create increasingly personalized advertisements for you and cash in with companies who want you to see those advertisements. Bringing it back to the devices, when you purchase an Android tablet or phone the cash price is usually going to be lower up front. However, it is geared toward Google services (rightly so). Most people will use the built-in apps provided by Google and, in doing so, send large amounts of data about themselves to Google over time. This can be in the form of email (Gmail), IM’s (Hangouts), Movies/Music/TV (Play Store), location data (Google Maps), etc. It’s likely few if any of us realize the extent of the data that we send them. It’s all built on the foundation of advertising so it all works toward fueling that end. On the flip side, companies like Apple have a more traditional business model. You pay a price for a product. Yes the monetary cost is higher, but it’s the entire cost up front. They do utilize cloud services and have you input your data to use various features. But the data is collected in order to allow you to use those services, not to assist advertisers. Don’t get me wrong, it isn’t like Google is hiding anything. They offer a free service or low-cost device and in return they get to use your data to target ads towards you. It’s all laid out from the start in their user agreements. The problem is that none of us really read those things. We just click through the agreement in a rush to see what cool features are in store for us. So, the takeaway here is just to be mindful. Nothing in this world is free, especially when it is made by a for-profit company. If you have privacy concerns then take a step back and evaluate what information you’re giving over for the services you use. If you’re happy with the return you get from those services and the more relevant advertisements that result from your data being used, then please continue to happily use their services and products. Just never assume that the only cost of your device was the cash value. Disclaimer: This post was written using Google Chrome on an Apple Macbook Pro. Over the last year or so I’ve been getting more into web hosting for myself and friends. Below are the solutions I’ve chosen to use and I would recommend them to anyone. Name.com: This is the site I’m using both to register my domain and to host the site. They are easy to use, affordable, and have great tools along with instruction on how to use them. WordPress: If you’re like me, you enjoy using the web and would like to harness the power of today’s innovations but don’t have the programming skills (or time) to write it from scratch. Enter WordPress. Sign up for a hosting solution (such as Name.com mentioned above), install WordPress, and your site is ready to go. From there it only requires simple gui-based configuration to customize your site and start taking advantage of the online world. Plus, there are tons of free WordPress plugins that will enhance the capabilities of your site for free. MailChimp: If you’re in need of a newsletter signup utility look no further. MailChimp will easily integrate with WordPress to have you signing up subscribers in no time. I think it will work well for personal machines. I’m going back to Windows 7 on my work laptop. In our case the apps we use just aren’t compatible enough with it yet and the interface doesn’t yield itself to higher work efficiency. Evaluate very carefully whether or not the software that is essential to you will work. Windows 8 is a big technology jump so you need to use the compatibility wizard and be sure. Don’t assume that if it works with Windows 7 it will be fine. All of the benefits remain. It is super fast, even more so than 7. It’s a fresh approach to interacting with a PC and I think that the majority of users will enjoy it as they get used to it.